A few months ago, my Mom gave me a ziplock bag of Amish Friendship Bread Starter. 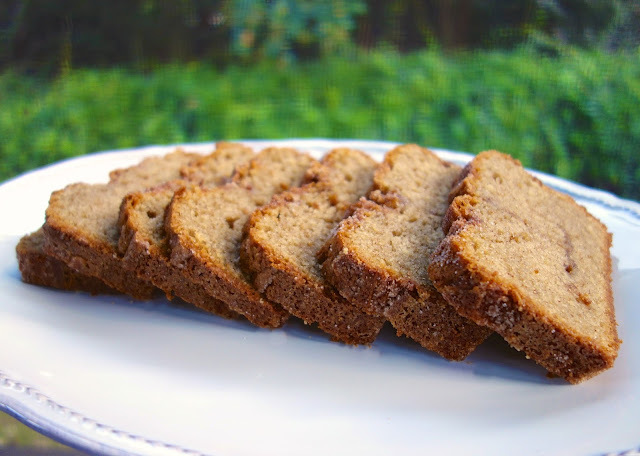 Believe it or not, I had never made or eaten Amish Friendship Bread. I took the bag home and squished and fed it. When it was baking day, I whipped up a batch and it was amazing! It isn't a bread you would eat a ham sandwich on, it is more of a bread you would slather with honey butter and stuff your face with. I know most of you are all like "I don't want to fool with a starter". I totally understand. It can be a hassle. The good thing about this starter is that it freezes well. You can also opt to just make all the bread instead of keeping the starter alive. I like to give homemade gifts to friends and neighbors. 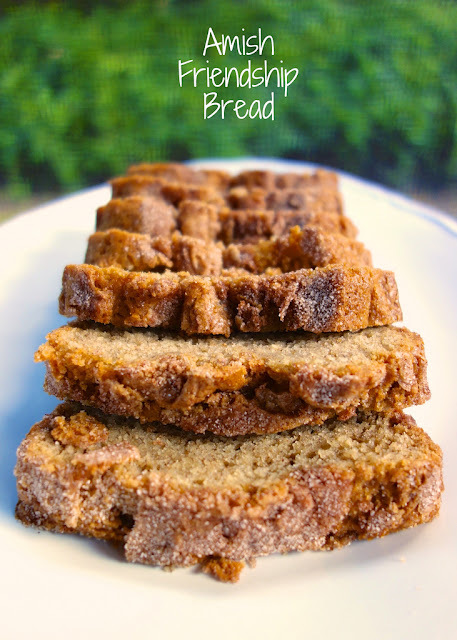 This Amish Friendship Bread makes a great holiday gift. You will get 10 loaves of bread with one batch of starter (if you don't save any to keep feeding). I think it is totally worth the 10 days of squishing and feeding to get 10 presents knocked out. Everyone I have given this bread to has loved it! In a small bowl, dissolve the yeast in warm water for 10 minutes. Stir well. In a large glass bowl, combine flour and sugar. Mix thoroughly. Stir in the milk and yeast mixture. Pour starter into a ziplock bag. Date ziplock bag so you know what day is "Day 1". Day 1: Do nothing. This is the date you made/received the bag. Squish the starter in the bag. Pour entire contents of ziplock bag into large glass bowl and add: 1 cup flour, 1 cup sugar, 1 cup milk. Mix well. If you are giving away the starter and keeping a bag for yourself, divide the starter mixture into 4 ziplock bags. Make sure to date the bags. Keep one bag for yourself and give 3 bags away with the instructions. The remaining one cup of starter will be used to make the bread. In a small bowl combine 1/2 cup sugar and 1 1/2 tsp cinnamon. Grease and flour two 9-inch bread pans. Dust pans with half of the cinnamon sugar mixture. Set aside. In a large glass bowl (the one you made the starter in), add ingredients for bread. Mix well. Pour batter into prepared pans. Top with remaining cinnamon sugar. Stephanie, I am one of those people who are intimidated by starters. But this bread looks fabulous. Clearly, I have to get over my fear! When I have a starter I reduce the amount of flour, sugar and milk I add on day 6 and baking day to 1/4 or 1/2 cup each instead of the 1 cup listed. That way my starter is still fed enough to keep going and I'm not scrambling to find 4 friends to share it with every 10 days. It keeps it going just enough so I have enough to bake with. You really can bake with it any day you choose. It is wonderful with chocolate chips thrown into the batter too!! Good to know you can bake it any day. I throw the extra starter in the freezer. I will try reducing the "feeding" next time. Assuming I'm using 1 cup of the starter to bake 2 loaves of bread, I understand that I'll have the remaining starter to use again (if I don't give any away). If I don't want to freeze the remaining starter, do I then treat it with the 10 day process again...and then bake more bread in 10 days? OR once the 10-day starter has been completed, I must then make the bread or freeze the remaining starter until I'm ready to bake the bread? Yes. You can repeat the process with all 4 batches of starter. That is way too much starter for me, so I toss or freeze the extra starter. I keep one going and freeze/giveaway/toss the remaining three cups of starter. At the end of 10 days you will have 5 cups of starter. Use one cup to bake 2 loaves of bread. You can then either make more bread with each of the 4 remaining cups OR give away 3 cups of excess starter to 3 friends (each given 1 cup of starter in a ziplock bag) and keep one for yourself and repeat the10 day process. Thanks . I get it now! I have made these for years. One way to mix it is to use butterscotch pudding & add butterscotch chips, skip the cinnamon/sugar though. There are all kinds of variations. I've added peanut butter & made peanut bread. Should the starter be kept in the refrigerator or should it live someplace warmer? I've never done anything with a starter before and don't want to kill it with cold by mistake. I stored mine on the counter. Thanks for posting! I love this bread, it is SO good. Like, I couldn't stop eating it the one time I made it. It's been awhile since I was given that starter bag so now I can start one up on my own and pass the rest out to friends :) Thanks! It is so easy to start - that is why I love it! I was actually fixing to email my fellow teachers today to see if someone had any starter. So glad I checked my email first--Now I can make my own!!! Thanks for sharing. I can't believe you posted pictures of the best bread I've ever eaten on your blog today. Blerg. Seriously. I think that loaf lasted fewer than 24 hours at our house. It was AWESOME! I used to make this and sell it. I would make chocolate using chocolate pudding, lemon using lemon pudding and can add poppy seed, butterscotch with butterscotch pudding and coconut using coconut pudding. OMIT the cinnamon in the batter and on top. Chocolate and lemon were my favorite. I have always wanted to try this. It looks delicious! Im confused. I made the starter tonight and I was going to divide it but there wasnt enough for 4 bags. Do I wait till I add again before dividing it? you have to wait the 10 days before you divide it up for friends. If I freeze the starter, when I make more bread do I take it out of the freezer and make the bread or start from day 1? My starter overflowed the bag one nite! Any idea how much starter should be in the bag on end day so I can compensate the add in before dividing? Doesn't seem like I should have to waste it all because some slipped out of the bag! That sounds amazing! I will try that on my next batch!